Dwarf hamsters and fancy mice can make excellent pets. They can be very active with great personalities. If raised and handled properly they’ll be your friends for life. Here are a few tips to get your pets started in their new home. They are sociable animals and should live with their own species, but they must be introduced before they’re fully grown (8 weeks for both dwarf hamsters and fancy mice). Dwarf hamsters are nocturnal which means they are most active at night, and fancy mice are crepuscular (awake on and off throughout the day and night). Both species can live for 1 to 2 years, but have been known to live longer. Check their food and water twice a day, making sure you clean any poo and woodchips out of their food bowl. Clean the cage thoroughly at least once a week with petsafe disinfectant. Make sure you clean everything your pet touches. Use a litter scoop to make this easier. Allow your pets to settle in for 24 hours before handling them for the first time. Play with your pets as often as possible, when handling them be gentle and stay close to the floor. A member of staff will show you how. Exercise is essential, let your pets have a supervised run around indoors as often as possible. A play ball is an excellent way for them to explore your house safely (use for only 20 minutes at a time). Do not feed LETTUCE or AVOCADO as these can be harmful. You can give them very small amounts of fresh fruit and vegetables, but no more than twice a week. Never pick your pets up by their tails as it hurts them. Although a few toys are a good idea, please don’t overcrowd their cage with them. We recommend: Rosewood Activity Tower. 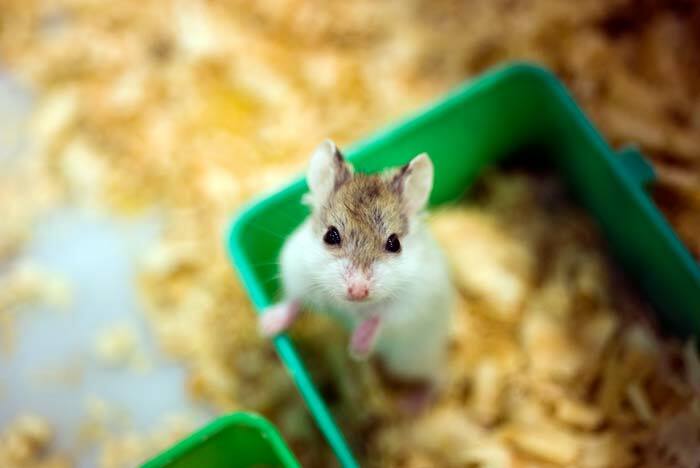 Dwarf hamsters and fancy mice can suffer with overgrown teeth that may have to be clipped by a veterinary surgeon. Always make sure there is plenty of gnawing material available. Fancy mice can contract respiratory problems. This may be caused by stress brought on by change of environment. If the breathing sounds crackly your animal will need to be checked by a veterinary surgeon. This can usually be treated with antibiotics. We recommend: Big Bark Blocks. Cage: Dwarf hamsters and fancy mice need a lot of room. The minimum suggested cage size for 2 animals is 59cm x 36cm x 25cm. The bars should be no more than 8mm apart or they may get their heads stuck or escape. 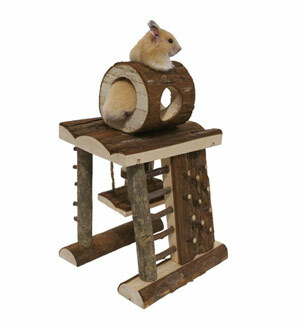 Exercise wheel: Dwarf hamsters and fancy mice are full of energy so a wheel is essential to keep them happy. 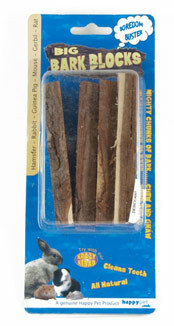 Woodchips: Use plenty of woodchips in the bottom of their cage, this will soak up urine and protect their feet (particularly if their cage has a wire floor). Food: They are both omnivores so dwarf hamsters should be fed a complete hamster mix, and fancy mice a complete rat mix. It is vital that animals are weaned gradually onto any new food. Toys: To stop your pets getting bored while you’re away toys are vital to keep them active.